There are symbols for the twelve classical constellations of the zodiac, which are primarily used for astrological purposes. Two symbols have been proposed for Ophiuchus, the thirteenth constellation of the zodiac - one in general use in Japanese astrology and the other based on the rod of Aesclepius. For the book One Hundred Year Star-Diary, I created symbols for a number of meteor showers. My symbols for the showers that emanate from zodiacal constellations were based on the symbols for those constellations. For the other ones, I created new constellation symbols - representing Lyra, Orion, Perseus, Ursa Minor, and the obsolete constellation Quadrans Muralis. 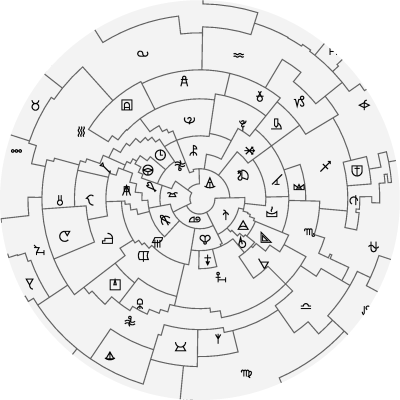 Having created symbols for those constellations, I wondered - could I make symbols for the rest of them? Over the course of two years, I have done exactly that. In some cases a diagram of the star pattern made a good symbol - in other cases, I've illustrated the object, creature, or myth represented by the constellation. For the more recent constellations I have sometimes taken inspiration from the diagrams and drawings provided by the constellation's creator. Carina, Puppis, and Vela are the 3 parts of the obsolete constellation Argo Navis, the ship Argo. Their symbols fit together to make a picture of the Argo. Antlia, the Air Pump, was named by Nicolas Louis de Lacaille. 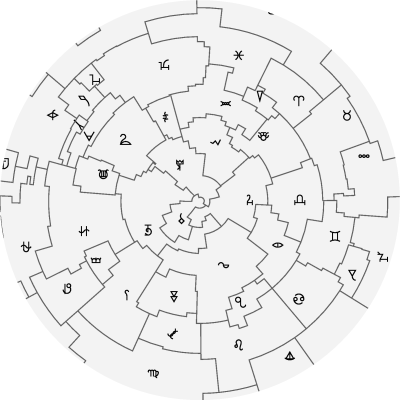 Its symbol is based on Lacaille's original drawing of it in his Planisphere, published in 1756. Fornax, Reticulum, and Sculptor are also based on Lacaille's depictions. Cepheus was a possibly mythical king of the Phoenician kingdom of Aethiopia. His Greek name, Kepheus, means "gardener". 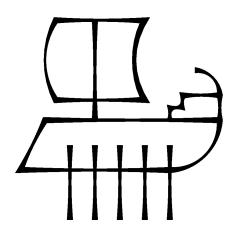 His symbol combines a crown, a tree or flower, and the Phoenician letter for the "k" sound. Coma Berenices commemorates Queen Berenice of Egypt sacrificing her hair to Aphrodite. The symbol depicts a severed lock of hair. The symbols for Corona Australis and Corona Borealis, the Northern and Southern Crowns, are simply crowns containing the letters A and B respectively. Crux is a cross-shaped constellation visible in the southern hemisphere. It points toward the south pole, which is why its symbol has combined a cross and an arrow. Draco has a number of interpretations, many based on a dragon or serpent guarding a tree or other object. Hercules's symbol is based on the story of the "Pillars of Hercules". Horologium's right ascension is about 3 hours, so it's appropriate for its symbol to be showing 3:00. Hydra and Hydrus are female and male water-snakes in the north and south of the southern hemisphere, respectively. Their symbols have their heads facing north and south, and also slightly resemble the feminine Venus and masculine Mars symbols. Indus, the "Indian", was intended to represent a native of the Americas. In illustrations it has often been depicted as a man with a handful of arrows, so I've used those arrows as its symbol. Leo Minor's symbol is a simplification of Leo's symbol. Likewise, the symbol for Canis Minor is a simplification of Canis Major's symbol, with Canes Venatici being a further simplification. Vulpecula is a long-eared variant. Lupus is a larger "dog" with a tail, or maybe just a single ear. Lynx is so-named because it is faint and one would need "the eyesight of a lynx" to see it. The symbol is an eye with a feline vertical pupil. Mensa, which borders the Large Magellanic Cloud, is named for South Africa's often-cloud-covered Table Mountain. Piscis Austrinus, the Southern Fish, also contains an A.
Quadrans Muralis is an obsolete constellation which depicts the astronomical instrument called a Mural Quadrant. It's included because it gives its name to the Quadrantids meteor shower. See the sightings page for a Chamaeleon tattoo. This page was translated into Slovak by Sandra Knudsen. Traditional constellation symbols are in the public domain. Lyra, Orion, Perseus, Quadrans Muralis, Ursa Major, and Ursa Minor symbols created by Denis Moskowitz and Alec Finlay for the book One Hundred Year Star-Diary and released to the public domain. 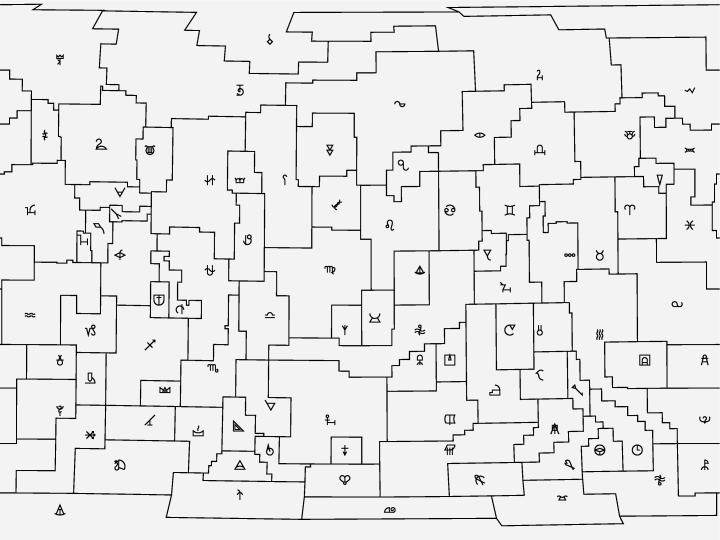 All other symbols created by Denis Moskowitz and released to the public domain. This page first posted Jul 31 2008 by Denis Moskowitz. Last modified Nov 24 2017.